Meditation is a foundation spiritual practice in almost all branches of Buddhism, but you don't have to be Buddhist to benefit from it. Meditation provides a protected time when we can slow down and devote ourselves fully to our breath, inquiry, chanting, visualization, or whatever form of meditation we select. Meditation has been scientifically proven to trigger the 'relaxation response' in our body - the opposite of the 'stress response'. Our muscles relax, our breath deepens, and our body releases chemicals that benefit our coronary and neurological systems. 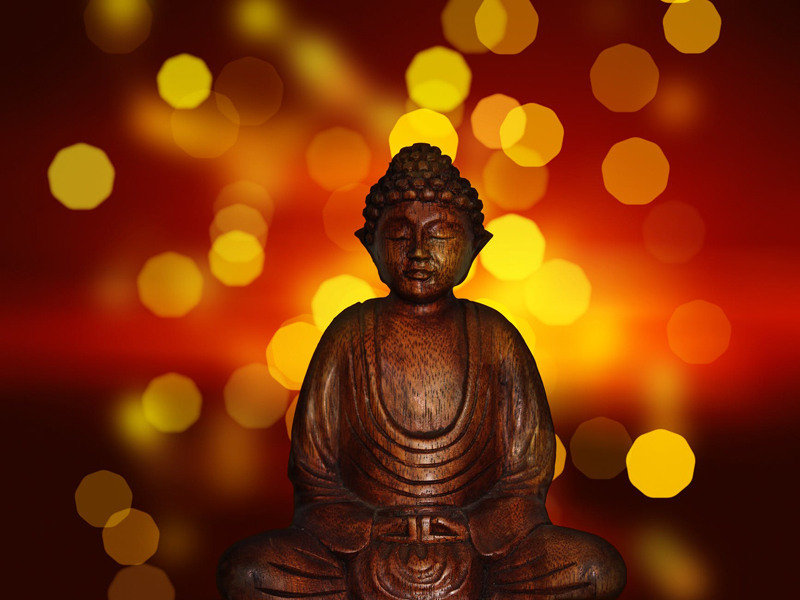 There are many different types of meditation taught within the various branches of Buddhism. The most basic form is breath meditation – simply following your breath, focusing on your inhalation and exhalation, and pulling your mind back to your breath each time it wanders. Breath meditation is particularly wonderful because you can do some variation of it in almost any setting. Even just taking 10 deep breaths can have a profound impact on your mind and body. To do breath meditation, just breathe, and try to really notice what that feels like. That's it! Notice how the air feels moving in and out of your nose or mouth. Notice what it smells or tastes like. Notice how it fills your lungs and relaxes your belly. When your mind wanders, just gently pull it back, without judging or berating yourself. Each time you pull your mind back, you have done a 'meditation pushup'. The value of meditation is in discovering the little quiet moments in your mind that you may never have noticed before - you don't need to battle with your thoughts or attention. 1. Create a dedicated meditation space. Whether this is simply a corner of your room, patio, or even a closet, having one little spot that you meditate in every day, and that is used for nothing else, will help condition your mind and body to shift into meditation mode each time you sit down. 2. Find the sitting position – and required pillows, etc. – that allows you to sit comfortably. Although there are differences in the preferred sitting position within different spiritual traditions, for beginners it is especially important to be comfortable. You can work towards an 'ideal' posture over time. In most traditions, a straight spine is the highest priority, so find a chair or configuration of pillows that allows you to have the straightest spine possible. 3. Personalize your space with inspirational items. Some people like to create a full meditation altar in their meditation space, with pictures, flowers, statues, and candles that they find soothing or that represent their spiritual ideals. Even if you don't have the space for that, try incorporating one or two items along these lines into your space. Even a small picture taped to the wall of the Buddha, a yantra, or even a simple flower, can help shift your awareness. Remember though that this space is a 'break' from your daily life, so this is not the spot for pictures of your cats, kids, or grandma! 4. Try to meditate at the same time every day. The key to developing a meditation habit is to incorporate it into your daily routine, even if it is for just a few minutes a day. The morning is often the most reliable time, because other events have not yet had their chance to change your plans. Try setting your alarm just 10 minutes earlier at the start, and dedicating that time to your morning meditation. If you are meditating at another time of day, try setting your phone or watch to go off at that time every day, as a reminder. Of course sometimes you have to be more fluid, and meditate whenever life allows, but working towards a routine will increase your chances of sticking with it. 5. Create a personal pre-ritual. Many people like to shower or at least wash their hands and face before meditating, as water is purifying and cleansing. However, a pre-ritual might be as simple as lighting a candle or some incense, or doing a couple of stretches or yoga postures. The key is to have some simple action that transitions you into meditation. Whatever you do, don't judge yourself too harshly or create guilt around missing meditations. That will only increase the chances that you become frustrated and give up. Be gentle with yourself but diligent, and if you are just starting out, consider creating a 4-6 week 'trial' period to jumpstart yourself. Studies have shown that this is the length of time it takes to develop almost any habit, whether brushing our teeth, exercising, meditating or anything else. Most importantly, just keep on meditating, whether it's once a month, a week or day! Find moments to build it into your daily life, and you will begin to experience its benefits for yourself.